What is the difference between GPS Tracking and iLOCi2? GPS Tracking App - allows you to both request a location and to broadcast your location to other GPS Tracking users in your contact list. iLOCi2 - lets you request a location. GPS Tracking App - allows you to request a location or broadcast your location to individuals or an entire group in your contact list. iLOCi2 – lets you send out a request to individuals. GPS Tracking version 1.2 offers turn by turn directions. iLOCi2 does not offer turn by turn directions. GPS Tracking Lite lets you program 3 contacts, full version unlimited contacts. iLOCi2 Lite lets you program 2 contacts, full version 16 contacts. How do I download and install an App on my iPhone or iPod? It's easy. Click here for simple instructions. What iPhone settings or requirements are needed to run LOCi Apps? iPhone OS 3.0 is required. Notifications need to be turned on and your LOCi app notifications must be turned on. Turn on Location Services under General Settings. Does LOCi only work on iPhones? For now only Apple products are supported. 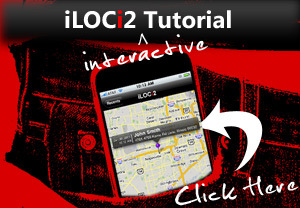 iLOC2 will run on your iPhone and iPod Touch and you do need to be running Apples 3.0 operating system. It's free and you can download it from iTunes. LOCiMe will only run on your iPhone and does not require the 3.0 operating system. Look for LOCi apps in the future running on Google's new Android and Black Berry devices. An ancient definition: LOCi were physical locations, usually in a familiar large public building, such as a market or a temple. The Method of Loci is perhaps the oldest mnemonic device. It was used by the Greeks in 500 B.C. to mentally position things-to-remember in a well-known location. LOCi is a suite of apps that use your mobile handset's internal GPS (or Cell/WiFi) location services to determine your "Location" latitude/longitude/altitude and utilizes the phone's cell based web services (HTTP) or the instant alerting feature included in 3.0 to transmit your coordinates to the GTX/PLS Portal or other devices that have downloaded the LOCi apps. Need help? Click here for tech support. The first time you run the app you will have to agree to the terms and conditions and then enter your registration details such as email, phone number and password. Once you have registered, hit the "+" button to add contacts. Enter your contact's name, email and phone number. IMPORTANT: The email and phone number you enter for your contact MUST match the email and phone number that they used when registering with Tracking. For example, if you are trying to add your son and he registered with ron@gmail.com - 8055551212 then you must enter it exactly the same way when you add him to your Tracking contact list. *If you enter 1-805-432-5653 then it will fail. No, you can only track the people that give you permission to be tracked. How is permission granted to track someone? When someone adds you to their contact list, you will receive a Permission Request email. Follow the instructions in this email to be able to share your location with them. What If I did not receive a Permission Request Email? From the app, go to ALL CONTACTS tab, you will be able to see everyone that has added you to their contact list and their status: Blocked or Allow. You can toggle their status by pressing on BLOCK or ALLOW. How often does the app share my location? Does the person in my contact list have to have the App for me to add them to my Tracking contact list? No. However, before you will be able to Track someone, they must have installed the app and have completed the registration process. If they don't have the app, an invitation email will be sent to them. How do I know if someone has the app? You will know if they have the app when you are able to add them to your Tracking contact list. What is the difference between GPS Tracking and TRACKING? Tracking runs in the background with iPhone OS 4.0 and above, therefore, it's sharing the phone's location in the background at set intervals (you can change the Time Interval.) GPS TRACKING sends and requests locations but the other party must accept your petition each and every time. Can I track other phones such as Android and Blackberry? Yes, currently the app works with Android and Blackberry. The app must be installed in their phone as well. Can I Track using a website? Yes, go to www.gpstrackingapps.com and login using the same details that you have registered with from the app. Your profile is automatically created in the website when you register from the app. Can I use the website even if I don't have the app? Yes, go to www.gpstrackingapps.com and create a free profile. Then search for people to add to your contacts. Then track them. Is there a monthly fee to use the website? No, the www.gpstrackingapps.com website is free. You only have to pay for the convenience of having the portable app installed on your phone. How do I start using GPS Tracking once I have downloaded the app? Hit the + button to add your friends to your contact list. Then you will be able to send location requests to them by tapping on the circle next to their name once they have registered. Does the person in my phones contact list have to have the App for me to add them to my GPS Tracking contact list? No, however they must download the App before you can start sending them a location (LOCi) request. You will know if they have the App if a green light is next to their name after you add them to your contact list. They have not downloaded the App or they registered under a different e-mail address. How do I ask them to download the App? On your contact screen there is an "Invite Others" button- that will prompt someone to get the App so you can begin exchanging location requests with one another. What if my friend downloads the App and I still see a red light next to their name? Probably they used a different e-mail address than the one you used to add them in your list or perhaps their e-mail address was incorrectly entered into your list. Confirm you are typing in the correct e-mail address and that your friend used that address when they registered GPS Tracking. Holiday Outage? Is your server down? Over the 2009 Holiday there was an issue with the Apple Notification Service, however the issue has been resolved and service has been restored. Does GPS Tracking work with unlocked or jail broken iphones? GPS Tracking does not work with unlocked phones, as device token is not generated by unlocked phones. Can I register with the same email address on iPad and iPhone? No, you must use a different email address in order to use the app on both. What are the Minimum Requirements to use GPS Tracking on my Android? How do I use GPS Tracking Android? Start the app, click on the settings tab, fill in the registration form and save it. Once saved a confirmation email will be sent to the registered email address. Click on the contacts tab and start adding your friends. Fill in their name, email address and phone number. Make sure you enter legitimate details as they will be used to send your GPS coordinates. After the contact is added an invitation email will be sent to the specified email address. If the invited user also downloads and registers the GPS Tracking App, their status will be shown as ready to LOCi in your contact list. Now click on the contact in your app and you will be able to send your location or request their location. Clicking on the send button will capture your GPS coordinates and an SMS containing your location will be sent to your contact. Your contact accepts your coordinates by clicking on the see LOCi tab and your location is shown on the map. Similarly you may request the location of your friends by clicking on the request tab. This will send SMS to other user and they can see the request by clicking on “request loci” tab. Once they click on your request their GPS coordinates will be sent back to you and a map will be saved in see loci tab. What is the difference between iLOCi2 and GPS Tracking? GPS Tracking App - version 1.1 includes text messaging. iLOCi2 - does not have text messaging. Will iLOCi2 work if I travel outside the US? Yes, only if data roaming is turned on. This may incur additional charges from your carrier. Make sure that you have pressed SAVE after you entered your name and email address. Add the following e-mail to your safe sender list or to your contact list: locimobile-no-reply@gtxcorp.com. Try registering again. If you get an "Invalid Parameters" error, make sure that Notifications are turned ON on your iPhone. To check if Notifications are ON, go to Settings and then press on Notifications. Then press on iLOCi2 and make sure that Sounds, Alerts and Badges are ON. Can you walk me thru the setup process for iLOCi2? Absolutely. Click here for the interactive iLOCi2 tutorial. What is the difference between the lite version and the regular version? Lite version is free and let’s you have 2 users on your buddy list. It is designed to show you how iLOCi2 works and means you can only LOCi 2 people. The regular version cost’s $2.99 and let’s you have up to 8 users in your buddy list and can enjoy LOCing –friends, kids and co workers. What if I have more than 8 friends or family members and want to LOCi more than 8 users? There is an iLOCi2 Platinum version which allows up to 24 users coming out soon along with an Enterprise version which will allow an unlimited amount of users. Please e-mail us if you would like to be notified when we announce the Platinum or Enterprise version release date. If I download iLOCi2 Lite and iLOCI2 Regular can I use them both? No. Once you download iLOCi2 Regular, it will disable your iLOCi2 Lite version. Does iLOCi2 use more power? Is the accuracy of my location affected if I’m inside a building? Yes since the GPS system relies on your phones ability to “see” satellites, being inside a building will reduce the LOCi’s accuracy. If you do not have a clear line of site to the sky your phone will use the nearest wifi location as your LOCi position. How do I check my pending locations? On the bottom menu of iLOCi2 press Pending. You will be able to see all the LOCi responses that you have not seen yet. How do I check the most recent LOCi from my contacts? Press on contact name that you wish to check. On the Most Recent LOCI section you will be able to check for address and timestamp of most recent LOCi. Press on “Map it” to plot the address on a map. What does "Awaiting Reply" mean on my contact list? This means that you have sent a LOCi request to your contact, but your contact has not responded to it yet. If you change your email address, an email will be sent to your new email address with instructions. Remember to inform your contacts of your new email address, as friends that have your original e-mail in their contact list will not be able to LOCi you. On the bottom right corner press on Settings and then press on Edit to change your name or email address. iLOCi2 Lite can store up to 2 contacts. iLOCi2 stores up to 8 contacts. Does iLOCi2 only receive location requests when in the foreground? No. A window will pop up, similar to a text message notification, to advise that a location request has been sent to you even if app is not in the foreground. How do I send a location request to my contact? Press on your contact name and then press on Send LOCi Request. An iLOCi2 pop up window will ask you to confirm the location request. How do I edit my contact list information? Press on the contact name you wish to edit. Press on Edit and then change information that you want. Press Save to confirm changes. What does "Pending Authorization" mean in my contact list? This either means that your contact has not downloaded the application AND/OR has not registered. If you believe they have downloaded the application and registered, please verify that email address in your contact list is the same email that your contact used to register. In the contact list screen, top right corner, press on “+”, fill out the contact info and then press Save. An invitation email will be sent automatically to your contact if they have not registered their application yet. What do I do after I download the application? Open the iLOCi2 application, fill in your name and email address and then press Save. A confirmation email will be sent to you with instructions on how to complete your registration process. Within the next two business days LOCiMe support will e-mail you credentials that will be used to login to your iPhone (only the first time) and for the tracking portal. I get this Message: "No valid User ID" OR "Password Does Not Match User Registration" OR "Invalid Phone Number"
ID and Password are case sensitive. Phone number must not include dashes and must be 10 digits long. Does LOCi work outside the US? LOCi will work outside the US but may incur data charges. If your iPhone service is provided by a US carrier, you may incur roaming charges. If your iPhone service is provided by wireless carriers outside of the US, you must check your data plan with your provider. How do I track my iPhone? Go to http://track1.gtxcorp.com and use credentials that were e-mailed to you by LOCiMe support. You can reach the tracking portal directly from the app by tapping on the icon in the lower portion of the screen. How can I add another iPhone to my account? We will be releasing new features and options soon and will inform you when these features are available. What are the fees after 90 day trial period? $5.99 per month or a $39 per year special for the first 5,000 users that register. Do I have to have my Location Services turned on in my iPhone general settings to use LOCi? When I start LOCi do I need to be outside to get a GPS lock? No, however a clear line of site to the skyline does increase the accuracy and time to acquire a lock. Why do the colors change from red to yellow to green when I start LOCi? Red means you do not have a GPS lock, yellow means you are starting to get a GPS lock and green means you have a GPS lock. How long does it take to get a good GPS lock (green)? It can take several minutes to acquire a GPS lock, especially the first time you start LOCi or if you start in a brand new location, however the average should be less than 45 seconds. Do I have to use the GTX PLS viewing portal to use LOCi? No, LOCi will let you see your current altitude, longitude and latitude directly on your iPhone, however if you want to view where you have been or let others view where you are or have been, then you do need to register on the GTX PLS viewing portal. Can LOCi run in the back ground or while I'm on my iPhone? No, unfortunately many apps cannot run in the background, however if you are running LOCi and your iPhone rings, LOCi will pause and wait for you to finish your call or other task and then you will need to push the start button again, to reinstate the app. LOCi will continue to collect your latitude and longitude coordinates and will transmit once it reestablishes a network connection, as long as you have not stopped the app by pushing the Stop and Clear button. What is the difference between Reporting Frequency and Location Frequency? Reporting Frequency is how often you want your iPhone to transmit its location coordinates back to the GTX PLS viewing portal. Location Frequency is how often you want your iPhone to collect and store your location coordinates. For example you may want to collect your coordinates every minute but only send back to the server every 10 minutes. Does transmitting my coordinates less often save battery life? Are there plans for future releases with more features? Yes, there is a LOCi Mobile suite of geo-specific applications scheduled for release every 2 to 3 months in 2009 through the beginning of 2010. For more information please visit locimobile.com or gtxcorp.com. How do I view this FAQ from within the App? From bottom right corner of the App, press on the "i" symbol to access the Frequently Asked Questions..